Eggplant is a member of the Solanaceae, or nightshade, family, and is related to the tomato and the potato, which are also members of this family. Eggplants are perennial plants that yield a product that's lauded in vegetarian, Italian and Mediterranean cooking. Eggplants are grown commercially for produce or can be grown in the home garden. Transplant small plants rather than starting eggplants from seeds. Purchase small eggplant seedlings at your local nursery or gardening store. Growing eggplants from seed does not ensure a good survival rate and must be grown in an extremely temperature-controlled environment, and it is not worth the headache and trouble when eggplant seedlings are readily available. Plant after the last frost, with no danger of a later frost occurring. Plant your eggplants in full sun, but shield against the wind, if possible. Eggplants can be planted in rows, with 18 inches between each plant in the row, and 30 inches between each row. If you are planting fewer plants, consider a raised bed. Create a raised bed by nailing four plywood beams together to make a square shape, then placing this in your garden and filling it with soil containing manure and compost. Place each eggplant 24 inches from one another if you are planting them in a raised bed. Fertilize wisely. When transplanting eggplants from their original pots into the garden, mix starter fertilizer into the soil, which can be purchased at your local nursery or garden supply store. Fertilize on either side of your eggplants, which is called "side-dressing," with nitrogen fertilizer approximately 2 months after planting. Do not over water, especially when the plant is young. As the plant matures, you will notice it begin to take more water. 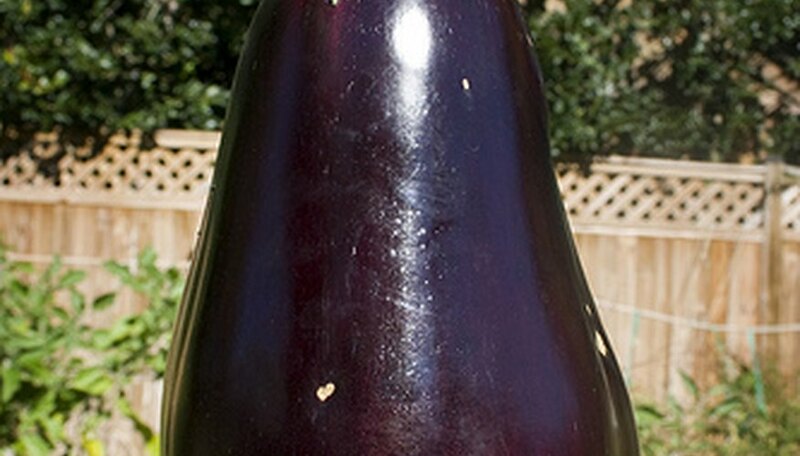 As it is growing, however, do not water the eggplant when it is wet. Only water it after it begins to feel dry. Harvest the fruit when it is between 6 and 8 inches long, according to the University of Illinois. The fruit should be glossy and firm. Remove the fruit with pruning shears, and do not break it off at the stem. This will promote more growth on the plant rather than damaging the stem. It will usually take 4 months after planting the seedling before eggplants will be ready to harvest. Eggplants are perennials, but because they usually do not survive through a frost, they will need to be replanted, as annuals do, the following spring. Keep pruning shears out of the reach of children. How Many Cantaloupes Grow From One Seed? Why Are My Tomato Plant Leaves Curling?